With the recent election of 59 new judges in Harris County (civil, criminal, family, probate, and juvenile courts combined), notable changes in court policies and procedures have taken shape. As one would expect, each of the recently elected judges in Harris County has implemented specific rules for conducting business in his or her particular court. As a guide to understanding and meeting their new requirements, some judges have provided updated links to forms online; others have posted checklists of required documents; and several others are providing supplementary links specifically for self-represented litigants, including to the Harris County Law Library’s community resource guide, the Pro Se Litigants Handbook. The Harris County Law Library has been keeping abreast of and adapting to these changes in order to best serve our public patrons. We are also, as always, paying attention to any changes at the state level. In late February, just shortly after the new Harris County judges were sworn in, statewide change was indeed taking place. Namely, the Supreme Court of Texas issued an order amending Paragraph 8 of the comment to Rule 1.01 of the Texas Disciplinary Rules of Professional Conduct, which now says that Texas lawyers must be aware of the benefits and risks of using technology in the practice of law. By adopting this standard, Texas joined 35 other states who agree that technologically proficient lawyers provide better, more efficient client representation. At final trial on divorce matters, parties must bring their proposed property division to trial in Excel or Google Sheets format on a USB drive. Complying with the ethical standard and local rules may require both access and training on specific hardware and software. If it seems daunting, the Harris County Law Library is here to help! Our 25 public access computers have the software you need (including Excel) to draft and assemble all your legal documents. And, our Hands-on Legal Tech Training courses, which we offer, on rotation, every Thursday at 2pm, will give you the knowledge and skills (and one free hour of CLE credit for Texas attorneys) to use that software and easily meet the requirements of the courts. In January, we introduced five new classes, including a popular new offering, Microsoft Excel for Legal Work. It will be presented again soon on May 16. Don’t miss it! For a detailed description of all our weekly classes, see the 2019 Legal Tech Institute Course Catalog. Classes always begin with a Getting Started portion. They gradually increase in difficulty until we Level Up. We then Go Pro, giving you an opportunity to build proficiency as the course progresses. We attempt to address every skill level in an effort to meet the needs of all attendees, and we’re always happy to answer any questions you may have about using tech tools and resources to strengthen your legal practice. Resolve to build your legal tech proficiency by watching free CLEs in 2019! The Harris County Law Library’s Legal Tech Institute provides access, via its web pages and the Law Library’s YouTube channel, to several on-demand learning opportunities. Watch videos from the comfort of your home or office and earn CLE credit, including ethics credit, as you learn. Additional videos, which no are no longer accredited by the State Bar of Texas but are still useful tools for learning about legal tech, are available at the same link. Supplement your online learning with in-person, hands-on legal tech training every Thursday at 2:00 pm in the Law Library’s Legal Tech Lab. View our new 2019 Course Catalog to find the right class for you! Explore the rest of the LTI page to register for our latest installment of the Legal Tech Institute Lecture Series, Blending Your Legal Research, which will be offered on January 17, 2019 at 12:00 pm at Congress Plaza. This week (Oct. 21-27, 2018) is the 10th Annual National Pro Bono Week! Legal organizations across the country have planned events to celebrate and educate pro bono attorneys in their communities, and the Harris County Law Library is no exception. On Thursday, Oct. 25, at 2 p.m., we’ll offer our first session of Free Legal Tech for the Public, which is designed to help pro bono attorneys and self-represented litigants make sense of all the great online resources available to help individuals representing themselves in legal matters. Everyone is welcome to attend this Hands-on Legal Tech Training from the Law Library’s Legal Tech Institute and Texas attorneys can earn 1.0 hour of CLE credit. Click for details and registration information. Hats Off to Houston Volunteer Lawyers! In the tradition of celebrating excellence in pro bono work during National Pro Bono Week, the Law Library would like to give a hat tip to Houston Volunteer Lawyers! HVL attorneys staff the “Library Booth,” which is a legal information booth where self-represented litigants with limited means can speak with a licensed attorney for free. The Library Booth is open Monday through Friday, 9 a.m. to 5 p.m., in the lower level of our downtown Houston location. Working in close proximity with HVL attorneys, our law librarians see the positive impact it has on our patrons to have ready access to pro bono attorneys who can answer basic questions. With guidance, self-represented litigants can make better use of the Law Library’s collection and have improved access to justice. Visit www.makejusticehappen.org to see all the ways HVL supports pro bono. For information about National Pro Bono Week events in Houston, visit the Houston Bar Association’s Pro Bono Week 2018 page. 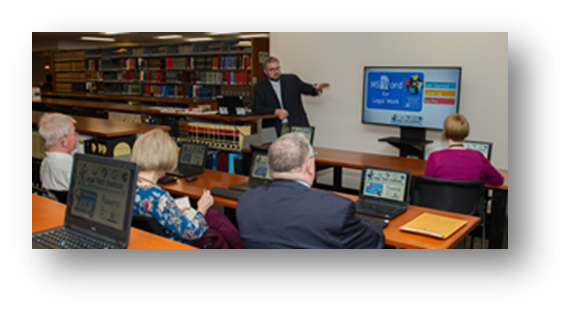 For more information about the Law Library’s Hands-on Legal Tech Training sessions, including the Pro Bono Week session of Free Legal Tech for the Public, visit our Legal Tech Institute website and click the Course Calendar. Excel is a data management tool used for organizing, calculating, graphing, and sharing tabular information. The importance of developing proficiency in the use of Excel cannot be overstated. Knowing how to manipulate spreadsheets is just as important as properly formatting a written document. According to some, we spend 10% of our working lives manipulating spreadsheets, so becoming adept at using Excel can only improve your efficiency and productivity. Several resources are available to those interested in developing Excel proficiency. For starters, we recommend that you visit our On-Demand Learning page from the Legal Tech Institute where you will find a recorded CLE called Excel Essentials for the Practice of Law, presented by none other than Ben Kusmin, the go-to expert on using Excel for legal work. Visit his website, Excel Esquire, for even more helpful tips and information. Secondly, we recommend that you download The Definitive 100 Most Useful Excel Tips, an outstanding resource guide that includes, along with each tip, a utility score, a difficulty scale, an estimated learning time, and a suggestion for how to apply each skill practically. If tackling 100 new skills seems a bit daunting, try a more gradual approach. Tackle just 10 Excel Functions Everyone Should Know, presented by Harvard Business Review. Certainly, there is a wealth of additional resources you may consult, but the suggestions provided here are a great place to start. Look for our Legal Tech Institute to offer a Hands-on Legal Tech Training course, Excel for Legal Work, in the new year. Hope to see you there! Need even more inspiration to become an Excel master? Check out this competition for expert Excel users, the Microsoft Office Specialist World Championship, where a new Excel spreadsheet champion is crowned every year. Alternatively, consider the work of this incredible artist, who “paints” Japanese landscapes using Excel. Spreadsheets aren’t just for number crunchers any more! The Legal Tech Institute at Harris County Law Library is happy to announce that one of the most popular programs in our LTI Lecture Series is once again available on the LTI On-demand Learning page. The Robot Lawyer: Artificial Intelligence in the Practice of Law can be viewed on our YouTube channel, accessible via our Legal Tech Institute web pages. Licensed Texas attorneys can earn 1.0 hour of CLE credit from now until September 30, 2019. Guest speaker, Saskia Mehlhorn, Director of Knowledge Management & Library Services for Norton Rose Fulbright US, provides a basic overview of AI in the legal profession, gives specific examples of tools that incorporate AI technology, and discusses opportunities for lawyers and other legal professionals to benefit from the power of AI technology. Don’t forget that we also offer a Hands-on Legal Tech Training session every Thursday at 2:00 pm in the Law Library’s Legal Tech Lab. Join us!